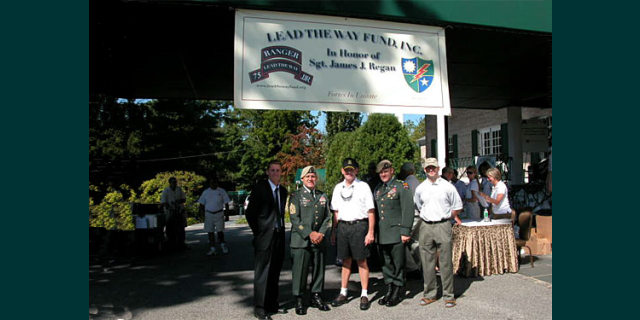 The Lead The Way Fund is excited to announce our Fifth Annual Lead The Way Fund Golf Outing on Thursday, September 15th 2011 at the Plandome Country Club. With over 400 participants last year, there is no doubt that this year’s tournament will go off bigger and better than ever! We are excited this year to, once again, have with us Army Ranger Sgt. 1st Class Leroy Arthur Petry, who was on July 12, 2011, awarded the Congressional Medal of Honor by President Obama for his heroic actions in Afghanistan. Please come join us for a day full of fun and patriotism as we celebrate and honor our U.S. Army Rangers. This golf outing is a great opportunity to give back to those who have sacrificed so much to protect our freedom and the quality of life we are privileged to enjoy here in the United States of America. Those of you who have attended in the past will undoubtedly recall many of the moments that make this yearly event so special. Participants will enjoy a round of golf at the Plandome Country Club or Sands Point Golf Club, a lovely brunch as well as an evening full of cocktails, dinner, awards and amazing live and silent auctions. Since its inception in 2007, the Lead The Way Fund has helped many Army Rangers who have been injured while fighting for our country by offering financial assistance that the government is unable to provide. With your ongoing support, the Lead The Way Fund can continue to reach out across this great country of ours to these brave soldiers and their families. You can learn more about the Lead The Way Fund and how it continues to make a positive impact on the lives of our American heroes and their families by visiting the Mission section of our website, www.leadthewayfund.org . To participate in this day of golf and festivities, please complete and return the attached form, or sign up online via the links below. Looking forward to seeing you all on September 15th! Registration for golf is now closed. Please send all payment directly to the Lead The Way Fund. Seats are still available for Dinner so please join us! Two registration options are available, Pay Online using a credit card, or Register Online and Pay by Mail (via check). Both options will secure your registrations. For those who feel more comfortable registering via paper please print the registration form below (PDF) and send it with a check to Lead The Way Fund. Online Registration Opens Friday July 8 2011 at 5PM.